Sheshatshiu is a community with a long list of troubles - but now one issue overshadows all else. This is the action of a desperate man... a chief tired of watching a generation lost to a disturbing addiction. Like airing dirty laundry, Paul Rich decided to let outsiders in on what's so often hidden. A last resort to get help for the kids. Children as young as six hooked on the noxious fumes percolating in their plastic bags. Baby faces... stoned night and day. So how did life in Sheshatshiu get so bad? Sheshatshiu is the largest Innu community in Labrador. The Innu were one of the last aboriginal peoples in North America to settle, to give up the hunt, give up the woods for village life in the 1960s. The lure of modern living was irresistible. But the transition from nomadic to community life was nothing short of disastrous. Now alcoholism, poverty and death overwhelm the village of 1600 people. "Our community of Sheshatshiu is not a healthy community," Paul Rich says. "So many things have happened over the past couple of years which we are so overwhelmed with and there's no way in the world this community can go on." He knows of what he speaks. Paul Rich may be chief here, but he's also the child of alcoholic parents. He was raised in foster homes. He's been sober since 1995. He's witnessed one tragic death after another. He blames them all on either booze or gas. (We spoke to the children through a translator). "My name is Phillip. I'm a gas sniffer. I sniff gas with my friends. In wintertime, we steal skidoos and we steal gas...." one says. "They haven't been home in days. They sniff around the clock and, like the others, pass out in a shelter - their only glimmer of stability, only source of food in an otherwise chaotic existence. For them, out here, in the freezing cold, is better than home. I don't go home because I sniff gas. And I sniff gas because both of my parents are drinking and I'm mad at that. And the other reason is they can't afford to buy me what I need," Phillip says. Carl says, as though it's a matter of fact, that his parents simply don't love him. "I believe that Louison and Lionel doesn't love me because when I don't do things they want me to do, Lionel hits me," he says. It's no way to live, says Angela, but it's the only way she knows to fend off her demons, nightmares that haunt them all. That's another reason why the Rich children (who are not related to the chief) get high on gas. "I can't stop sniffing because I'm very lonely especially when I'm alone... I want to see things I see when I am sniffing," Angela says. Carl's best friend and brother lies beneath the freshly fallen snow. A little boy named Charles, a little boy lost to the deadly mix of gas and child's play. It was just seven months ago. Eleven-year-old Charles was playing with a candle in a neighbour's basement. He was also sniffing. Then the bag ignited... Carl and Phillip watched helplessly. Carl is haunted by his brother's death. "I hear him calling in my ear I hear him when I'm gas sniffing and even when I'm not, I hear him," Carl says. "I was there when Charles was on fire. I was there when Charles caught himself on fire. And�I was outside and I saw someone running all over the place inside the house. He was up in flames. And I saw him go up in flames. I saw his whole body go up in flames. I saw his face getting burnt. "At one point Charles ran towards me when he was in flames because I, too, was sniffing gas and the fumes were very strong on me, I ran away because I was afraid I, too, would be caught on fire," Phillip says. The fire exploded, then chased down his throat, burning more than 80 per cent of his body. The house charred to rubble.... the children who watched scarred beyond measure. Their brother talks to them in their dreams and when they're high. "Charles tries to get me to stop. I won't stop because it's the only way I can communicate with Charles," Carl says. "I can't and I won't stop sniffing gas because when I do, I see my brother," Angela says. Chief Paul Rich says the children are victims of a culture clash, caught between the old world and the new. Its roots go back to the resettlement of the Innu. "It's the Innu people ourselves who've got to solve these problems and we've always said that," Chief Rich says. "But the problem is that we have no resources. We're the lost people." The Innu are unique. Sheshatshiu is not a reserve. The Innu are not status Indians, they are political orphans. Without recognition as a First Nation they get no say over education, health or social services. They can't even pass a no-littering bylaw let alone ban gas sniffing. "Since 1949 the provincial government of Newfoundland and Labrador has put us under their legislation without consulting with us, without talking to us," the chief says. "And when that happened that's when the community went in crisis� the community was all dumped in one area and they were forgotten about and this is where we are today." Paul Rich says that powerlessness is why so many turned to booze and gas. "They feel hopeless because there's nothing out there that gives them the incentive to stop drinking. Sometimes when that happens, the parents forget about their kids." "I have never neglected my kids," Lionel Rich says. Carl was adopted by Lionel and Louison Rich when he was a month old. He, Angela, and Phillip are among 13 children, all raised in a three-bedroom house. Six children share a bed, depending on how many show up each night. Carl prefers the woods, Angela stays with her boyfriend, and Phillip wants to be anywhere but home. "I don't know why Paul is blaming on the parents. I often say to my kids gas sniffing is dangerous. I think Paul is wrong saying to the Innu people who and what to blame," Lionel says. But Louison admits drinking is a problem in her home. "This is how we grew up, all our relatives drank," she says. Nobody taught us how to drink ... same thing with our children. We didn't teach them how to sniff. Maybe we have similar cases, their sniffing and our drinking. They see us drinking and they sniff." "I would like for my mother to stop drinking. I too would stop sniffing gasoline," Angela says. "The children said the only reason we sniff gas is because you guys are drinking," Louison says. She told Phillip, "We did quit drinking as you guys requested but you guys never stopped sniffing." She's very confident she could stop drinking it if the children would stop sniffing. Lionel says the same, "I could do it on my own without treatment... we can do it, we can stop drinking." But on this night, thoughts are far from who should stop first. The room falls quiet while their uncle plays a song for their dead brother, a song that produces a rare but tender moment for a boy hungry for attention. "It's too hard for me," Lionel says. "I've been thinking about him every day and I'm also waiting for him to come home every night." He says that's why they drink. But they drank and the kids sniffed before Charles died. Now he has an excuse not to stop. They lost one child to the gas, and know the others are at great risk, especially Phillip. He didn't, or couldn't, cry when Charles died. He sniffs instead. "Sometimes, I often think about suicide... about committing suicide," Phillip says. Those dark thoughts haunt Angela, too. She knows what happened to her brother, knows the danger, she has a cigarette in one hand, gas in the other. "I think I'll never stop sniffing gas. I want the same thing to happen to me that happened to my brother Charles," Angela says. "I want to die the same way my brother died... while sniffing gas." "They're saying it's better if I die because nobody cares for me," Chief Paul Rich says. "The most important people who should care for their kids is the parents. If the parents won't admit that they're making mistakes, it's coming from all over. It's not to put parents down but it's to show the kids and to show the parents that we're trying to save them." The Innu reached a deal with Ottawa for cash, status and help. Several children did get treatment. Some were sent to a military barracks in Goose Bay. The band council also asked the province to forcibly remove some children at risk whose parents refused to seek help for their kids. Sheshatshiu is an Innu village on a narrow inlet on Grand Lake, on the north central coast of Labrador. It is about 20 kilometres north of Goose Bay, site of the Canadian Forces Base, where NATO training flights were based. Three major river systems come together in the region where the Innu people have lived for generations. Sheshatshiu, which means "narrow place in the river," was a traditional summer gathering place for the Innu who followed the caribou herds, their main source of food and clothing. Innu means "human being." The language is "Innu-aminun," which is part of the Algonkian group of aboriginal languages. Their name for Innu homeland in Labrador and Eastern Quebec is Nitassinan. Most of the Innu in Sheshatshiu are bilingual, speaking both Innu-aminun and English. The first European contact with Sheshatshiu came in 1743 when a French merchant named Louise Fornel established a trading post on what became a major travel route for the inland fur industry. The Hudson's Bay Company founded its own trading post at nearby Northwest River 1836. In 1914, Sir Wilfred Grenfell built a hospital, orphanage, school, and student dormitory at Northwest River. A Roman Catholic church was built at Sheshatshiu in 1957. At that time, both the church and the government began to pressure the Innu to settle down. Many people lived in traditional tents or a few houses around the church. More houses were built in the 1980s, as well as a school and a clinic. Today it is a village of about 1,000 people, most of them Innu. According to the 1996 Census, about 55 per cent of the population was over 15 years old. The average age was 22 and while in most of Canada, the population is aging, in Sheshatshiu, the demographic trend means the population under 15 is still growing. Only 135 people were employed in the labour force with an average income of $11,452, all but 20 in service industries. Of people over 25, Statscan says 49.4 per cent have less than a Grade 9 education. Just 10 people have completed university. "The history of colonization here has been lamentable and has severely demoralized our People. They turn now to drink and self-destruction. We have the highest rate of suicide in North America. Children as young as 12 have taken their own life recently. We feel powerless to prevent the massive mining projects now planned and many of us are driven into discussing mere financial compensation, even though we know that the mines and hydroelectric dams will destroy our land and our culture and that money will not save us. 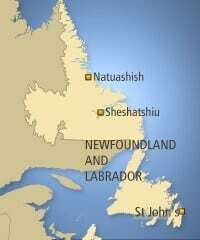 The Labrador part of Nitassinan was claimed as British soil until very recently (1949), when without consulting us, your government ceded it to Canada. We have never, however, signed any treaty with either Great Britain or Canada. Nor have we ever given up our right to self-determination. The fact that we have become financially dependent on the state which violates our rights is a reflection of our desperate circumstances. It does not mean that we acquiesce in those violations. We have been treated as non-People, with no more rights than the caribou on which we depend and which are now themselves being threatened by NATO war exercises and other so-called development. In spite of this, we remain a People in the fullest sense of the word. We have not given up, and we are now looking to rebuild our pride and self esteem." Historians trace the problems among the Innu of Sheshatshiu and other troubled villages such as Davis Inlet (Utshimassit in Innu-aminun) to the 19th century when they became somewhat dependent on European traders and the fur trade. But in the early 20th century the Innu faced increasing competition from non-native trappers. In the 1930s, there were two blows to the Innu. At the start of the Depression, the fur industry collapsed - there was no market for furs. At the same time, the caribou herds suffered a population crash. Later there were more pressures on the Innu. The provincial government imposed hunting restrictions. Large areas of traditional Innu landing and hunting areas were flooded by the Churchill Falls Hydroelectric project in the 1970s. During the 1980s, the Canadian Forces used the airbase at Goose Bay for NATO training and the Innu often protested against low-level overflights by jet fighters. Elizabeth Penashue from Sheshatshiu was one of the leaders of a group of Innu who occupied a NATO bombing range at Minipi in 1994 to protest the training flights. The recent Inco proposal to build a giant nickel mine at Voisey's Bay presented both promises and problems to the Innu. There was the promise of jobs in developing the mine, but there were also concerns about environmental damage from the operation. Disagreement between the Newfoundland government and Inco led to the postponement of the project and the collapse of any chance at jobs for the community. When it comes to substance abuse, gasoline falls into the group called "inhalants." Inhalants include anything that gives off chemical fumes that cause drug-like effects if inhaled. Common household items like paint, paint thinner, glue, lighter fluid, liquid paper and nail polish remover are all inhalants, as are things you would find in a garage such as kerosene and antifreeze. Inhalants provide a cheap, legal and easily-available high. The way gasoline fumes affect the body and brain mimics the effect of alcohol. Initial effects include hallucinations, euphoria, lethargy, loss of appetite, slurred speech and blurred vision. These effects usually last several hours. People who use inhalants can expect to experience low energy, headaches, and vomiting, and develop mouth and nose sores, nosebleeds, and throat and ear infections. And then there are the more serious effects - including permanent damage to the liver, kidneys, eyes, bone marrow, heart, and blood vessels. Chronic sniffing can also cause lead poisoning, which may not be detected until severe medical problems arise. Lead poisoning manifests itself in many different ways, such as convulsions, impaired mental function, neurological damage, kidney damage, anemia, coma and even death. Since the 1970s, countries have been phasing out the use of lead as an additive in gasoline to reduce the danger of lead poisoning linked to breathing in car emissions. Even more frightening is that people can die after using inhalants only once. Users can fall victim to what's called "sudden sniffing death." That's when their heart undergoes extreme stress, resulting in severely irregular heartbeats, collapse and death. Sudden sniffing death is triggered if users are startled, if they get into a fight shortly after inhaling, or by some other event that wouldn't cause cardiac arrest under normal conditions. Other people can fall victim to their own high, committing reckless acts like jumping off high places believing they can fly, or wandering into traffic. Teenagers use inhalants more often than any other age group, according to the Addiction Research Foundation (ARF). In a survey conducted in 1995, ARF found that 2.4 per cent of students in Grades 7 through 13 had sniffed glue in the previous year, while three per cent said they had inhaled other inhalants such as gasoline. Because inhalants are simple, everyday objects that kids can provide easy excuses for having, parents often don't find out their child is a substance abuser until the abuse has already become a habit. This makes help difficult as it's best to start treatment before addiction sets in. And yes, inhalants are addictive. People who become dependent experience the same withdrawal symptoms associated with drugs and alcohol. Hand tremors, constant headaches, nervousness and excessive sweating aren't uncommon in people trying to break away from using inhalants. But perhaps more difficult than killing the physical addiction (toxic chemicals from inhalants stay in the body for a long time, causing users to feel the effects even weeks later) is dealing with the social problems that lead the person to use inhalants in the first place. The reason inhalant abuse often occurs in isolated communities is that there isn't a lot to do and when a child needs help, there aren't the resources available that there are in a big city or urban area. Treatment can last for as long as two years because it means moving children away from their relationships with other abusers and building their self-confidence. But the most important support can come from the child's family at home.